Running over two sites this weekend, Junta Local will be appearing in Botafogo, in Rio’s ‘Zona Sul’ (South Zone) and in Barra da Tijuca, in Rio’s ‘Zona Oeste’ (West Zone). RIO DE JANEIRO, BRAZIL – Returning this Saturday, August 25th in Botafogo’s Christ Church, and also appearing from Saturday, August 25th to Sunday, August 26th at Cidade das Artes in Barra, Junta Local is bringing its uniquely sustainable and local market back to Rio for what is always a hugely popular event. Junta Local brings together small producers dedicated to local and fair food. Whether from the countryside or in the city, they prioritise producers who have a concern the environment and for quality of ingredients that guarantees great food, photo internet reproduction. Junta Local will be appearing in two different locations this weekend in Rio. On Saturday, August 25th the sustainable market will be occupying the grounds of Christ Church, Botafogo, from 10AM to 5PM. Alongside the usual sustainable producers and food stalls, there will also be the members of the ‘Chega Junto’ (Come Here) project, offering authentic street food from various countries around the world. Chega Junto is a special project of Junta Local that brings together refugee producers for an ethno-cultural-culinary exchange, to both support and learn about these different cultures through their gastronomy. At 3PM there will also be a musical performance by Rebel Layonn alongside Haitian percussion from the Mawon project. Rebel Layonn (James Vergneau) is a singer, song writer and musician, from Port-au-Prince, Haiti. He is widely regarded by the Haitian reggae world as an inspiring voice for hope, love and unity. This edition of Junta Local is the first for newly opened Cru Natural Wines. “We started at Junta Local with Winehouse, and this is the first that we’ll be participating in with Cru, and, yes, we will be having natural wines: one red, one white and one rosé.” Comments Dominic Parry, of Winehouse and Cru Natural Wines. Another debut on Saturday will be for the British and Commonwealth Society, who will have its first ever food stand at the fair. “Look out for the red, white and blue stand with Union Jacks, sausages, cakes and more!” says Alexander Corrie, of the BCS. “We’ll have three participants on our stand this week. It’s a community affair and you’ll recognize them from the BCS garden party in June. Louise May will be supplying barbecued English sausages; Martin Whitefield, aka The Artisan Baker is offering a huge range of goodies; and Joanna Ribeiro dos Santos will have three types of cookies.” He adds. 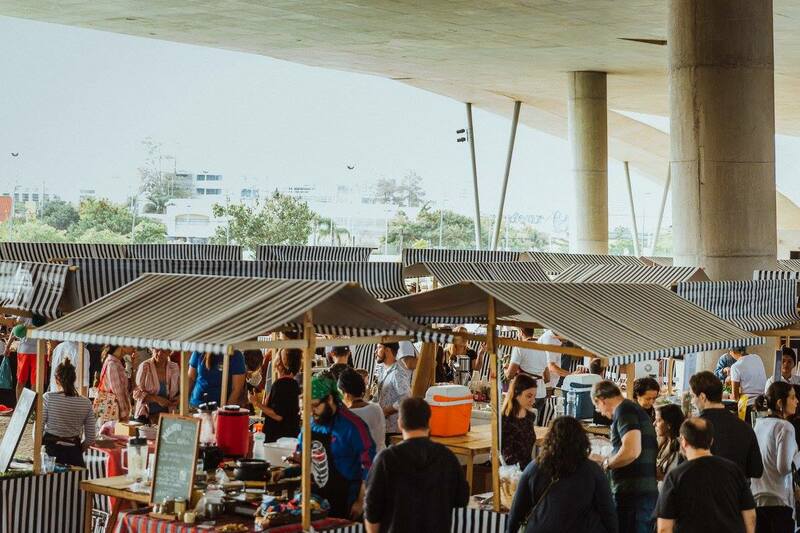 Running concurrently on Saturday and also going over to Sunday, Junta Local will be setting up shop in Barra da Tijuca’s ‘Cidade das Artes’ (City of Arts). This will be the fourth fair of the smallholder community that has taken place in the Cidade das Artes, photo internet reproduction. On Saturday, August 25th and Sunday, August 26th, more than fifty independent producers will occupy the ‘Praça da Cidade das Artes’ (Park of the City of Arts), with an enormous variety of products, from organic fruit and vegetables, to freshly baked bread and handmade cheeses, wines, craft beers and cooked food made with the best local ingredients. There will also be a wing with vegan producers, curated by Coletivo Primavera. As part of the program, there will be performances of live music, an urban garden and a theater workshop. On Saturday, August 25th at 1PM there will be an introductory guided tour of the market and urban garden as well as a demonstration by The Horta das Artes project, a social and environmental education program on how to develop and care for urban community gardens. Then at 3PM there will be a live performance by Trio Ventura, bringing their unique brand of high-paced, highly danceable forró. On Sunday, August 26th at 11:30 AM, there will be a planting at the urban garden with the artist Carlos Vergara and Organicity. At 1:30 PM there will be a show by ‘Os Tupynambás’ (The Tupynambás). Following this, at 2:30PM there will be a workshop on Agroecological Management by Horta das Artes with the help of Organicity. At 3pm there will be theater games with ‘Arte Volante’ (Flying Art). The Junta Local team also invites everyone to bring their towels and baskets for picnics and also to enjoy the sunset in the garden of the Cidade das Artes.